Visio 2013 has (at last) brought us the Metro file format, otherwise known as Open Packaging Conventions (OPC) standard (ISO 29500, Part 2)! You can read about Open Packaging Conventions Fundamentals at http://msdn.microsoft.com/en-us/library/windows/desktop/dd742818(v=vs.85).aspx. Visio file formats were unchanged for versions 2003, 2007 and 2010, except that Visio 2010 saw the addition of the *.vdw format, which is basically the *.vsd with a XAML overlay added. There were two choices of file formats – the Visio binary format or the verbose DataDiagramML Xml format. Visio 2013 has done away with the binary file format, but has provided alternative extensions for those documents that contain macros. As you can see, the VBA project that contains the macros are in a file called vbaProject.bin, and the logo is a media file, called image1.png. Of course, the vbaProject file will not be present in any non-macro-enabled files. It all looks quite enticing to open and manipulate using code! If you want to find out more, then download [MS-VSDX].pdf from http://www.microsoft.com/en-us/download/details.aspx?id=25255&WT.mc_id=rss_alldownloads_all . 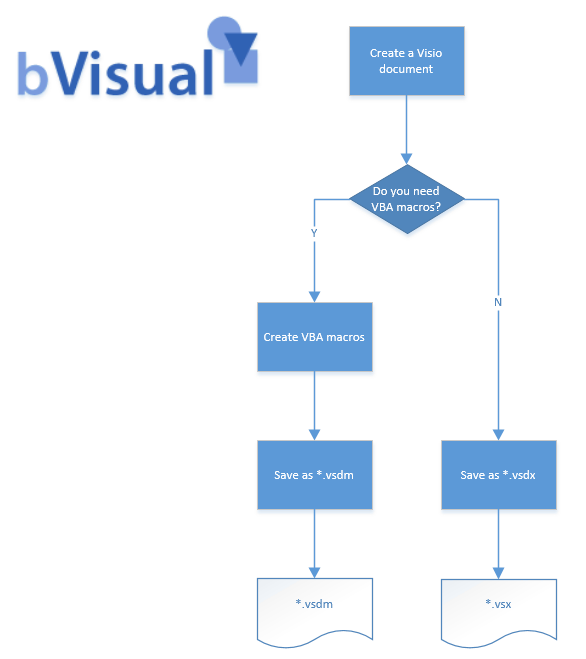 This is the preliminary documentation for the Visio Graphics Service VSDX File Format, and an introduction to the new Visio 2013 file format at http://msdn.microsoft.com/en-us/library/office/jj228622(v=office.15). I’ve been trying to use XSD.exe on the released visio 2013 XSD files so that I could utilize an XML deserializer, but I’ve been running into one roadblock after another…is there someone who has released 2013 compatible .cs objects that can be used to serialize / deserialize the open xml formats for visio 2013? 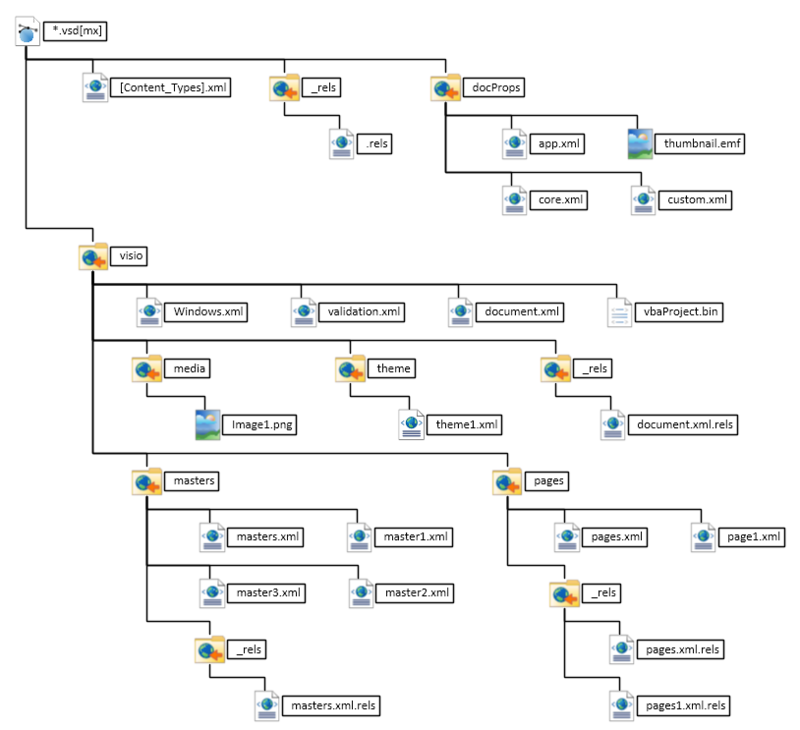 This is why the 2013 open file format is intriguing — we can have developers author in Visio, but compile on our server farm by going against the raw files. Also important is that the raw file reads are much faster than out-of proc calls against Visio, and even in proc calls as an add-on.